The survival of China's national mascot is being further threatened by large-scale forest clearing and commercial plantations, says new report. Local governments in Sichuan are exploiting a loophole in the law to clear natural forests and replace them with commercial plantations, posing further threats to the giant panda and China's already-declining biodiversity, says a recent report released by Greenpeace. In 2009 China published “Technical Regulations on Reconstruction of Low-function Forest” which allowed for the regeneration of low-yield natural forests. But a desire for profit has led local governments to use those rules as justification for felling the existing trees and replacing them with different species. Much natural secondary forest is now 'monoculture'-type plantations of quick-growing trees for commercial use. Cutting down an entire forest in a single season is cheaper than selective felling – 33 yuan in labour costs are saved per cubic meter of timber. But it does huge harm to the environment. Felling of natural forests in the name of “regeneration of low yield forest” will damage the local ecosystems, reduce biodiversity and destroy habitats, according to Zhou Lijiang, one of the main authors of the rules on forest regeneration. The most pressing task now, he says, is to stop the clearances. Greenpeace’s on-site surveys and interpretation of remote sensing data has found that almost 20,000 mu (1,333 hectares) of the forest felled are within the Sichuan Giant Panda Sanctuaries world heritage site. 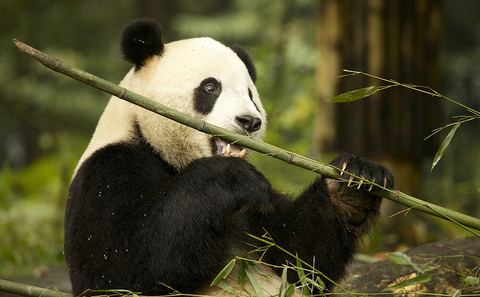 Sichuan is home to most of China’s giant pandas. Greenpeace started to track razing of forests in 2013, using remote sensing data and making seven trips to the sites. The investigation found that since 2009 large areas of natural forest have been felled and replaced with commercial forestry. The clearances need to stop, Pan said, or one-third of China’s natural forest may be lost and replaced with commercial plantations. In an earlier interview with chinadialogue, Fan Zhiyong, senior director of the WWF China Science Policy and Innovation Centre, said that while State Forestry Administration surveys had found large increases in panda numbers, the risk of losing individual panda communities was actually increasing due to habitat destruction. Construction of roads, railways, mines and hydropower stations and the felling of forests is preventing different panda populations from mixing. If that fragmentation continues, 24 of the 33 communities will be at risk of loss. Wu Hao, a senior investigator with Greenpeace, told chinadialogue that the group has reported its findings to the authorities, but so far nobody has been held to account. Greenpeace is calling on the State Forestry Administration and the Ministry of Housing and Urban-Rural Development to investigate and carry out a full assessment of the environment of the giant pandas and other protected species, and then to produce a plan for restoration. New policy on the transfer of forestry rights has allowed contractors to obtain stretches of land previously held by a number of individual forest farmers. This is making felling and regeneration more common. According to Greenpeace, thousands of mu of forest are changing hands in every county of Yan’an. And due to the large size of these areas, it is often possible to obtain hundreds of yuan per mu in government regeneration subsidies. Wu Hao told chinadialogue that forest farmers are also opposed to the felling and complain of a poorer environment, dirtier water and fewer panda sightings. But the money they can make from selling their land is tempting. Zhou Lijiang said that these are healthy forests, and locals could develop ecotourism as a source of income, if they are left intact. According to Wu Hao, it doesn’t matter if the felling is carried out by individual farmers, contractors or forestry companies. “It’s all in direct contradiction to the aims of regeneration of low-yield forests,” he said.